We have a passion for delivering a world class experience by focusing on you. Venterra Realty was established in 2001 with the assistance of John Foresi and Andrew Stewart, two Canadians who saw the potential of returns in multi-family real estate in the United States. They saw this as a venture into new territory so the name “Venterra” was formed from the words “venture” and “terra” meaning land. They founded the company based on a set of core values, the basis of how company decisions would be made, people would act and business conducted. Those values are still rooted deeply in the company today. Who says work can't be fun!? 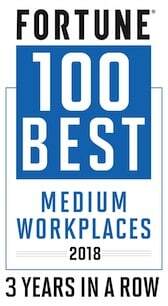 Venterra offers a truly unique culture that not only motivates employees professionally and personally, but encourages fun. Venterra originally managed four communities (about 800 apartment homes) in Austin, and Houston, Texas and had only 35 corporate and on-site employees. Venterra has grown to proudly manage apartment communities in 12 major US cities that provide housing to over 28,000 people and 4,000 pets. We currently manage a portfolio worth over $1.2 billion with a total revenue of $170 million and have grown more than 22% since 2013. We haven’t just expanded our size; we’ve grown into a company that is paving a new way in the industry, where our employees can really make a difference, career growth is available and where our residents are provided an amazing living experience! The Venterra family has been the most enjoyable part of my time with Venterra. It’s not only the people I work with but everyone I have met at other properties and regions. The culture is just welcoming and kind.